What you need to know about Diesel Exhaust Fluid (DEF), including how it works, how to properly handle it, where to buy it and where to store it. All forestry equipment manufacturers are going through the growing pains and education process of dealing with Diesel Exhaust Fluid (DEF) as production of Tier 4 final machines begin. This “new” fluid that invokes such concern has actually been used for some time, introduced commercially to on-road markets in 2004. Tigercat introduced its first Tier 4 machine, a 620E skidder in September, 2013. By providing proper education to dealers and customers, the introduction of additional models using DEF has had minimal impact to the end user. Much like fuel, there are specifications and handling procedures that must be respected to ensure the complete system functions properly. Here are the basics that you need to know to be successful with DEF. DEF is a clear mixture of chemical grade urea and demineralized water. Those familiar with the agricultural industry may be familiar with urea, which is a common nitrogen based fertilizer. However, DEF is made with chemical grade urea, with strict limits on the amount and type of particles in the urea. The Environmental Protection Agency (EPA) regulates the amount of particulate matter and nitrogen oxide emissions an engine can produce. DEF is used in conjunction with a catalyst to lower nitrogen oxide emissions. DEF is injected in the exhaust stream, breaking down into ammonia and reacting with nitrogen oxide to form water and harmless nitrogen gas. This chemical reaction is most efficient at high temperatures. Extended idling (4 hours for T4i, 9 for T4f) or low load operations should be avoided where possible. How much DEF does the machine use? DEF consumption is normally 6-8% of fuel consumption for Tigercat Tier 4f machines. In extreme applications it can be as high as 10%. The exact consumption depends on the machine model and some environmental conditions. Where do I buy DEF? Most truck stops and gas stations stock DEF in 2.5 gallon disposable jugs with built in spouts for the on-road market. DEF can also be found at stores such as Walmart, NAPA and Canadian Tire. Make sure the seal is present and intact when the cap is removed. Contractors with large fleets may find this impractical, preferring to buy and store in bulk totes or drums. In this case, extra care must be taken to ensure that the excess amounts do not get contaminated. With all of the DEF suppliers available, which brand do I choose? All DEF must meet ISO 22241 specification and be certified by the American Petroleum Institute (API). DEF should not be diluted with any other fluid, including water or be used with any additives. Doing so risks adding chemical contamination into the system. Any product promoting low temperature DEF or additives should be avoided. If you use DEF that does not meet the required specifications, your machine may operate correctly for a short duration, but minerals in low quality DEF will quickly build up in the after-treatment system, leading to an inevitable and costly failure. To put this in perspective, it only takes two teaspoons of oil to contaminate a 5,000 gallon tanker of DEF. Use only DEF that has the API logo on the label. How much will DEF cost? Input costs are a prime and legitimate concern in the timber harvesting industry. How much is this new fluid going to cost? Since the Tigercat FPT engines are more fuel efficient than previous Tier 3 machines, (and most competing Tier 4 machines) the cost of DEF is easily offset by reduced fuel consumption. The end user will not see any increase in operating costs by using DEF. How do I store DEF? DEF has a defined shelf life that is temperature dependent. Proper storage maximizes shelf life. For reference, DEF stored at 38 °C (100 °F) will last less than three months but stored at 27°C (80 °F), it will last approximately one year. DEF that has expired will cause emission components to function incorrectly and limit the performance of the machine. Ideally DEF should be stored between -5°C and 20°C (23°F- 68°F), which will result in a shelf life of up to three years. It should be stored out of direct sunlight and away from possible contaminates. How not to store DEF – In direct sunlight, with 34°C temperatures, and the transfer equipment exposed to dust and dirt. It is a good practice to understand how much DEF will be consumed and to maintain no more than a three month supply to avoid risks associated with expiration. DEF should only be stored in sealed and approved containers that have not been previously used to store other fluids. As shelf life is limited, DEF should be stored to allow for first-in, first out usage and the manufacturing date should always be reviewed to ensure you are not purchasing or storing expired DEF. Freezing does not harm DEF. The freezing point of DEF is -11 °C (12°F) and takes some time even at extreme cold to freeze completely. The DEF system is heated, both electrically and with engine coolant, so even if DEF freezes in-tank, the machine will thaw it. It is good practice to fill the tank after each shift – since the tank freezes from the outside in, it will keep liquid DEF near the suction line. Regardless, once the machine has been brought up to working temperature the thawing process is well underway and the operator should not be waiting for DEF to thaw. How do I fill up the machine? The first and most important step in filling up the DEF tank is to clean the area around the tank fill cap. Do not remove any of the strainers or filters in the system. This equipment is necessary to protect the system from contamination. Smaller disposable jugs of DEF have a built-in spout. 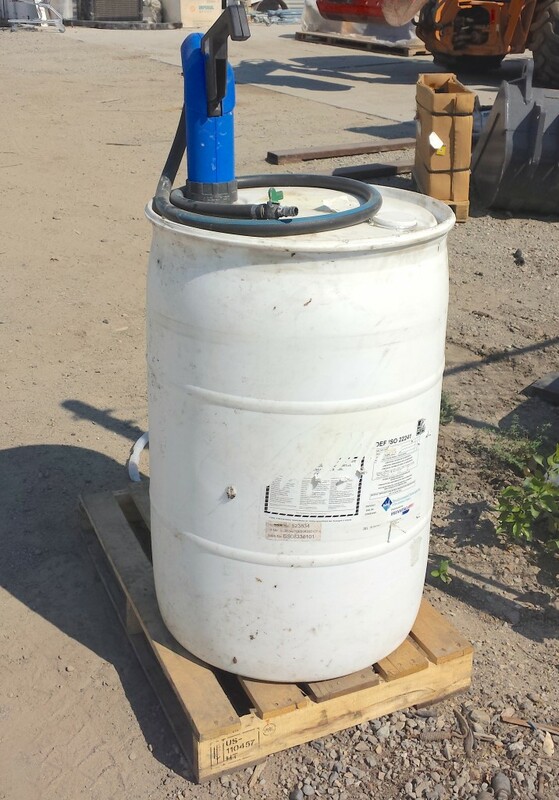 If larger totes are being used, a transfer container or pump system may be required. These should be constructed of a material suitable for DEF such as stainless steel or polyethylene, including all fittings within the system. Do not use transfer containers that have previously stored other fluids or containers that are not specifically approved for DEF. Only two teaspoons of oil will contaminate a 5,000 gallon tanker, according to reputable supplier, Brenntag. How do I service the DEF System? The most recurring issue observed in the field is contamination in the DEF tanks. It cannot be stressed enough that dirt and debris must never enter the DEF tank. Large debris will plug the inlet of the suction strainer and small debris could damage the DEF pump and injector. There are multiple strainers and filters in the DEF system. However, this equipment will not protect the system if it has been removed or compromised. Cleaning a DEF tank is not the easiest job and it is best to avoid contamination to begin with. If dirt or debris has made its way into the tank, only DEF or demineralized water should be used to clean the tank. Remember, chemical contamination damages the catalyst and is one of the biggest risks to the after-treatment system, so no brake cleaner or ether. What happens if my machine runs out? Running out of DEF is actually quite a challenge. The DEF level, much like the fuel level, is displayed on the machine computer and multiple alarms are broadcast as the DEF level reaches 10% and below. As per EPAregulations, the machine will begin to lose power when 5% DEF level is reached and will continues to do so until the DEF tank is empty at which point the machine is left to idle. This process takes hours. Full machine power can be restored by simply filling up the DEF tank. With all of the guidelines for using and handling DEF suggested in this article, it may seem like a lot to remember. However, with a bit of experience handling DEF, it will all become second nature. With the use of high quality fluids, stored correctly and kept free of particulate or chemical contamination, the DEF system will function flawlessly.